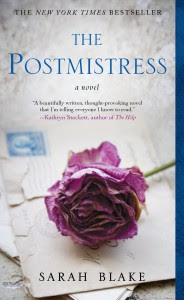 The Postmistress has been one of those titles that has been floating around the blogosphere for a little while now. It definitely has been on my radar. I have read a few reviews some time ago, before I had agreed to review it, and they have been both favorable and not so. When I got the opportunity to review it, I knew I had to give it a go. And after completion, I am glad I did. I seem to remember reading Grange House, the first novel by Sarah Blake, a long time ago but I couldn't tell you what it was about from memory. I remember being some what intrigued by the gothic story line of it all and that's about it. The Postmistress is a bit different from her first book. Set in 1940, both in a small coastal town in Massachusetts and in London, it focuses on the lives of three very different women. Iris is an older woman who holds the position of Postmistress or as she calls it the Postmaster position in the town of Franklin, MA. She is smart, a bit serious, somewhat guarded but clear in her role in her job and well received in the community. Emma is the young new wife of Franklin's new doctor, Will. Orphaned as a child, she holds deep rooted feelings about being alone, being left and being invisible. Will changes that and makes her feel alive and connected to life in a way she hasn't felt. Frankie is the quick witted, ballsy war reporter based in London. Working along side Ed Murrow, her job is to tell the world what is really happening in those early years of the war. These women collide in a somewhat fractured but thought out story. It seems to fall to Will, Emma's husband that starts it all. Will decides he needs to go to London to help the war victims. He gives Iris a letter to give to Emma if he does not return alive. Will runs into Frankie in London while hiding out in a bomb shelter. What happens there is the climax, I guess, of the book and ultimately what cements the women's lives together. That's the basic story in a nutshell and overall, I was engaged enough to continue reading. It seemed to fall pretty heavily on Frankie and a lot of her experiences getting out into the thick of it and reporting the war news. At times, this got a little heavy handed and seemed to get away from the story as a whole. I liked the parts with Iris and Emma and their small town. Iris had her love story with Harry, the older man who sat on top of his roof looking out for German tanks. Emma had her side story when she discovers she's pregnant and pines for her husband to come home. I find the time period around World War 2 to be fascinating and tragic at the same time. I liked that Frankie was trying to bring it home to the whole world that was listening that war was indeed upon us all. I was intrigued that in Franklin, Iris and her community didn't seem to feel affected. The author did portray those differences in geography quite well. This was a quiet, somber read. I was expecting a bit more surprises but overall I was pleased enough with it to continue reading. The ending had enough of what I needed for the story to wrap up. It was matter of fact but still bittersweet. I do recommend this book for fans of any women's fiction, even those who like historical fiction. It does go into the politics and the war with Frankie's portion but it also has some powerful love stories and strong female characters. I can't say that I would passionately recommend this but I do think it has a strong enough story and well written characters, that it deserves a readership. Yes, I think this book would be a perfect fit for book clubs exactly. It has that blend of women's roles, history, love, marriage and loss. I think it has enough going on in it to generate a good discussion. I, for one, am passing it along to my mom who I think would love it. Thank you to TLC Book Tours. Please join in on the rest of the stops. Tuesday, March 1st: You’ve GOTTA Read This! Tuesday, March 15th: Book Club Classics! Thanks for the review, Michelle! I'm glad you were able to recommend it to your mom and to book clubs, but I'm sorry it wasn't a perfect fit for you. I'd been thinking about reading this--heard it recommended by a friend. I think I will try to find it now. Thanks. i started reading this one last year but just could not get into it at the time - perhaps it's time to pick it back up again. great review! I deliberated over this one in the book shop a few days ago but decided against it. After reading your review, I don't think it would be for me. I am still trying to find this book! it is not a question of buying (not available) but scooting around trying to see whether its available in my second hand shops. I'd rate this one pretty much the same way you did. There was a lot to like about it but it just didn't entirely work. Alas, not one for me. Read this back when it first came out with a "first look" group through B&N and yeah...it was a case of cover envy from the start, but the hugely historical tones of the book squelched it for me. Cie la vie...glad you enjoyed it though!